This document provides a summary of typical costs of cycling interventions and the factors that affect them, drawn from expenditure during delivery of Phase 1 of the Cycle City Ambition (CCA) towns. This report lays out the basis for the evaluation of the eight Cycle City Ambition towns that the Department for Transport has supported with capital funds of £191m between 2013 and 2018. Two further evaluation reports will be published: an interim report (2018, awaiting publication) and a final report (2020). The six Cycling Demonstration Towns were funded by Cycling England and the Department for Transport to implement comprehensive strategies to encourage more people to cycle, including ‘smart’ behaviour change measures as well as new cycle infrastructure. The average increase in cycling, as measured by automatic cycle counts, was 27% over the three year programme. There were increases in the number of people cycling, amongst both adults and children. Comparator data suggested that this was unlikely to be simply a reflection of a wider national trend. The investment offered high value for money. This report for the Department for Transport and Cycling England brings together the key results from the first three years of the Cycling Demonstration Town programme. 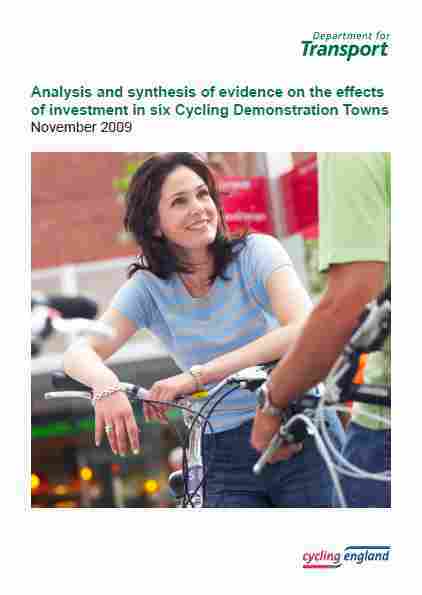 This is a summary of the final outcomes of the Cycling Demonstration Town (CDT) programme (2005 - 2011) and the Cycling City and Towns (CCT) programme (2008 – 2011). The two programmes funded 18 towns and cities to implement strategies to encourage more people to cycle. Cycling trips increased across both programmes overall, and also individually in all 18 towns and cities. From automatic count data, there was an overall increase of 29% for the six CDTs in 5.5 years (range across towns: 6% - 59%); and an overall increase of 24% for the 12 CCTs over three years (range across towns: 9% - 62%). The annual rate of growth for the CDT programme was 5.3% and for the CCT programme 8.0%. This was comparable to rates of growth in international cities which have demonstrated sustained long-term commitment to cycling.